Good organization design initiatives begin with the work. This proposition, that firms should design around the work being done rather than people doing it, is no longer a particularly contentious one. It follows from a relatively straightforward chain of logic. In short, if you start with the stock price and work your way down, you always end up with work. If we accept that logic, the question is no longer whether firms should design around work, it’s how best to do it. There is of course significant precedent for this in the field of industrial engineering. Time and motion studies and process optimization have created trillions of dollars in value by streamlining operations in factories and fulfillment centers. But in these cases the relationship between the work and the value it creates is explicit and quantifiable. The number of orders processed per hour or boxes shipped per day is discrete, tangible, and conveniently easy to count. But what about a research scientist designing a new product or an HR Business Partner onboarding a new employee? In such cases the connection between the work and the value it creates is tenuous and indirect; measuring it becomes a more complex undertaking. Concentra approaches this thorny problem through a technique called activity-driven organization design using OrgVue. Our definition of Activity-Driven Organization Design is the process of analyzing the activities performed by the workforce to ensure they align to the overall business strategy. The first step is to articulate the work your organization is currently doing. This is best done by building a hierarchy of activities, logically breaking down each process into its constituent parts. Organizations like the American Productivity and Quality Center (APQC) provide excellent starting points and can be further customized through workshops with functional, business leaders and OD advisors until an accurate reflection of the work is achieved. Having built a taxonomy of activities, the next step is to survey the existing workforce. Using modern, online survey tools, employees can map their time to their work, creating direct, explicit linkages between the people in the organization, the activities they conduct and the time spent conducting them. Next is to interrogate the data across multiple dimensions to understand the value of work. Because there is an understanding of the total time spent on each activity, this can analyzed further by seniority, department, talent designation and, most crucially, cost. What results is a holistic picture of how time and money flows through the work in your organization. It is effectively a representation of your investment in your operating model. This view into the current state provides an objective baseline to compare against the corporate strategy. Are you under-indexed in areas that are critical to the business and over-indexed in others? If you have a stated strategy to grow a particular product line or expand into a new geography do the numbers reflect that? Activity-driven organization design provides an efficient and repeatable mechanism to answer those questions. Continuously monitoring the alignment between the corporate strategy and the current operating model is an organizational best practice and a key hygiene factor in assessing organizational health. 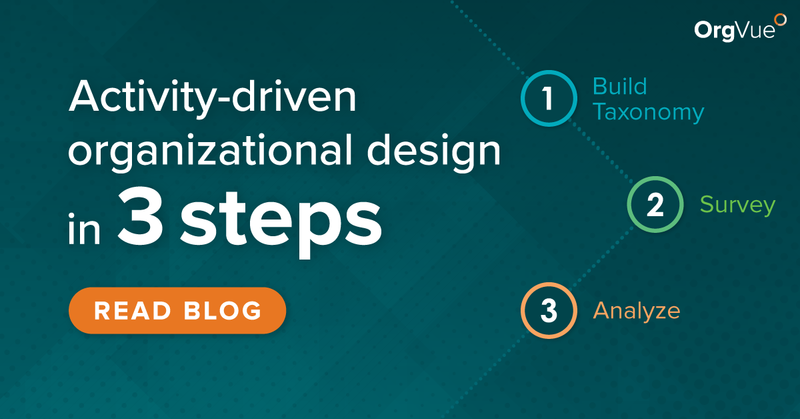 Activity-driven organization design is a proven technique for generating the data necessary to drive and sustain that alignment. Concentra’s OrgVue automates the steps of activity-driven organization design. Find out more about how it can help you to raise your people game.